The finance world is full of acronyms and jargon that can be confusing. 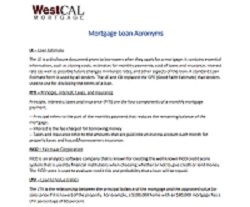 Here is a list of common mortgage loan acronyms with brief explanations to keep you in the know. At the bottom, we have included a downloadable PDF version of this article for future reference. The LE is a disclosure document given to borrowers after they apply for a mortgage. It contains essential information, such as closing costs, estimates for monthly payments, cost of taxes and insurance, interest rate (as well as possible future changes in interest rate), and other aspects of the loan. A standard Loan Estimate form is used by all lenders. The LE and CD replaced the GFE (Good Faith Estimate) that lenders used to use for disclosing the terms of a loan. — Principal refers to the part of the monthly payment that reduces the remaining balance of the mortgage. — Interest is the fee charged for borrowing money. — Taxes and Insurance refer to the amounts that are paid into an escrow account each month for property taxes and hazard/homeowners insurance. FICO is an analytics software company that is known for creating the well-known FICO credit score system that is used by financial institutions when choosing whether or not to give credit or lend money. The FICO score is used to evaluate credit risk and probability that a loan will be repaid. The LTV is the relationship between the principal balance of the mortgage and the appraised value (or sales price if it is lower) of the property. For example, a $100,000 home with an $80,000 mortgage has a LTV percentage of 80 percent. DTI is the ratio of the quantity of someone’s debt compared to the quantity of their income. It is used by mortgage lenders to determine a person’s capacity to pay off debts. It is expressed as a percentage and calculated by dividing monthly debt by gross monthly income. The CD is a document, very similar to the LE, with the final closing cost, payments, interest rate, and other aspects of the loan disclosed to a borrower. It is required to be acknowledged by the borrower three days prior to signing the final loan documents. A federal law that required lenders to fully disclose, in writing, the terms and conditions of a mortgage, including the annual percentage rate (APR) and other charges. This was a previously required disclosure document for home loans, but is now replaced with the Loan Estimate (LE) and Closing Disclosure (CD). The ARM mortgage permits the lender to adjust its interest rate periodically on the basis of changes in a specified index. An agency of the U.S. Department of Housing and Urban Development (HUD). Its main activity is the insuring of residential mortgage loans made by private lenders. The FHA sets standards for construction and underwriting but does not lend money or plan or construct housing. Minimum down payments are only 3.5%. The Veterans Administration is a federal government agency authorized to guarantee loans made to eligible veterans under certain conditions. The VA guarantee allows qualified veterans to buy a house with no down payment. Moreover, the qualification guidelines for VA loans are more flexible than those for either the Federal Housing Administration (FHA) or conventional loans. Fannie Mae is a government enterprise created as the nation’s largest source of financing home mortgages. Fannie Mae does not originate mortgages; they buy and guarantee them through the secondary market. The FHLMC is another government enterprise, similar to Fannie Mae, and was designed to reinforce homeownership and rental housing for the middle class. The FHLMC creates mortgage-backed securities by purchasing mortgages, guaranteeing, and securitizing them. These mortgage-backed securities are very liquid assets. A GPM is a form of fixed-rate mortgage where the payment steadily increases over time (usually 7-12% annually until it reaches the full monthly payment). The HARP is provided by the Federal Housing Finance Agency as a program for homeowners with homes that are worth less than the outstanding balance on their loans. It provides lower interest rates for such homeowners and was designed in 2009 to reduce the foreclosure rate after the housing crisis. A special type of mortgage that enables older home owners to convert the equity they have in their homes into cash, using a variety of payment options to address their specific financial needs. The main qualifying factor of this mortgage is the value of a borrower’s home. This is also called a reverse mortgage. Homeowners aged 62 or over can convert their equity into cash. The equity can be paid to the homeowner in a lump sum, in a stream of payments, draws from a line of credit, or a combination of monthly payouts to the borrower and line of credit. In addition, there are no monthly payments required from the borrower until the borrower no longer occupies the property. HUD is a government agency that reinforces homeownership and the growth of communities by providing opportunities for affordable homeownership, affordable renting, diminishing homelessness, and preventing housing discrimination. The IRRRL is provided by the US Department of Veterans Affairs (VA) as a mortgage refinancing program for homeowners that have VA loans. The purpose of the program is for homeowners to refinance a fixed loan at a lower interest rate or to transform an adjustable rate mortgage (ARM) into a mortgage with a fixed rate. Unless a person is refinancing an ARM into a fixed rate mortgage, the interest rate on the new loan is always lower than the interest rate on the old one. LIBOR is a benchmark rate that represents the interest rate at which banks offer to lend funds to one another in the international interbank market for short-term loans. LIBOR is an average value of the interest-rate which is calculated from estimates submitted by the leading global banks on a daily basis. It is used as the first step to calculating interest rates on loans globally. If you have any questions or would like to get pre-qualified for a home loan, feel free to contact me!